In this workshop, you'll create an artwork with deep, personal significance that symbolizes your connection to a poem (or other text). Using text to establish a visual vocabulary, you'll discover resonant words, colors and symbols and then develop those individual elements into a composition through play and media exploration. You’ll translate your composition into a wall sculpture that features smoke-fired porcelain beads and hand-stitched layers from a mix of natural fibers. Pre-formed porcelain shapes will be provided. You'll learn an easy and satisfying slip resist technique before burnishing and smoke-firing them. Stitching and embellishing demos will show you how to bind together your symbolic wall sculpture. Carolyn Hazel Drake is a mostly self-taught artist from a long line of craftswomen. She is a third generation Oregonian, and her aesthetic is grounded in the colors and textures of the Pacific Northwest. 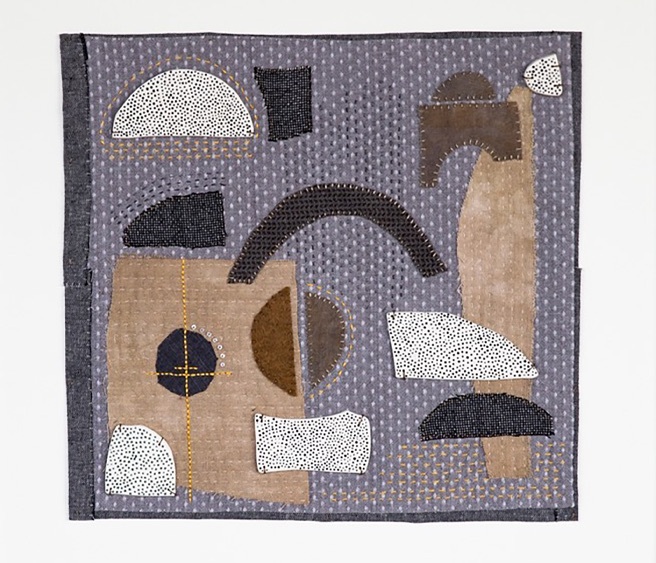 Her eye for color, pattern and detail was cultivated early on in her mother’s quilt store, as was her appreciation for handwork and being a part of a creative community. Carolyn has worked with all levels of learners, and her belief in the inherent creative potential of her students guides her approach to teaching.